Vandue Kaboodles Junior Plush Rocking Horse w/Sound Just $41.25 Down From $129.99 At Sears! You are here: Home / Great Deals / Vandue Kaboodles Junior Plush Rocking Horse w/Sound Just $41.25 Down From $129.99 At Sears! Sears has this Vandue Kaboodles Junior Plush Rocking Horse w/Sound on sale for $41.25 (Reg. $129.99)! Kaboodles Junior are our newest series of plush rocking horses are sure to make your little cowboy or cowgirl feel like they’re the real deal, herding cattle and chasing Indians in the Old West. 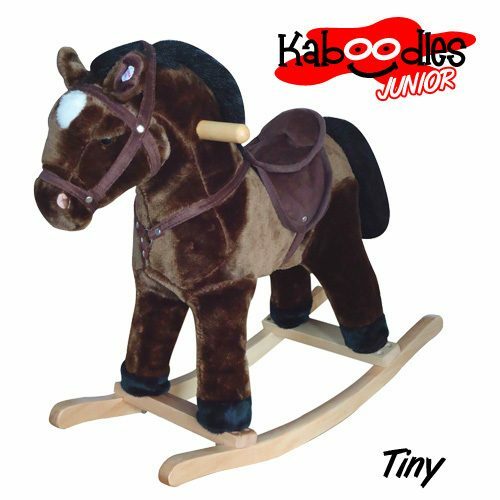 Smaller than our original Kaboodles, the exciting sound make him each horse more realistic and make playtime even more fun! It is soft and plush to the touch with a nicely cushioned saddle. It is hand crafted with a real wood core, and stands on sturdy wood rockers. Each horse features a supple saddle with bridle and metal stirrups. Each horse also is fully animated with lifelike neighing and galloping sounds. Your lil’ buckeroo will love to ride his horse because of its life-like character. This beautiful piece will surely be a focal point in any little boy or girl’s room.